Published: Feb. 18, 2015 at 03:01 p.m. Updated: Feb. 18, 2015 at 03:39 p.m. The NFL Scouting Combine is obviously important for every prospect working out, but it can really impact the fortunes of those who have something to prove. The workouts and interviews represent a major opportunity for prospects to show representatives from all 32 teams -- in a controlled, favorable environment -- that they have what it takes to make it as a pro. The following 12 players are some of the youngsters who stand to help themselves a great deal in Indy. Armstead is a huge hit-or-miss guy. He didn't have a lot of production at Oregon (four sacks in three years) for someone with his size, speed and athleticism. Of course, that athleticism is nothing to sneeze at, considering he spent time on the Ducks' basketball team. Can Armstead play end and rush the passer? 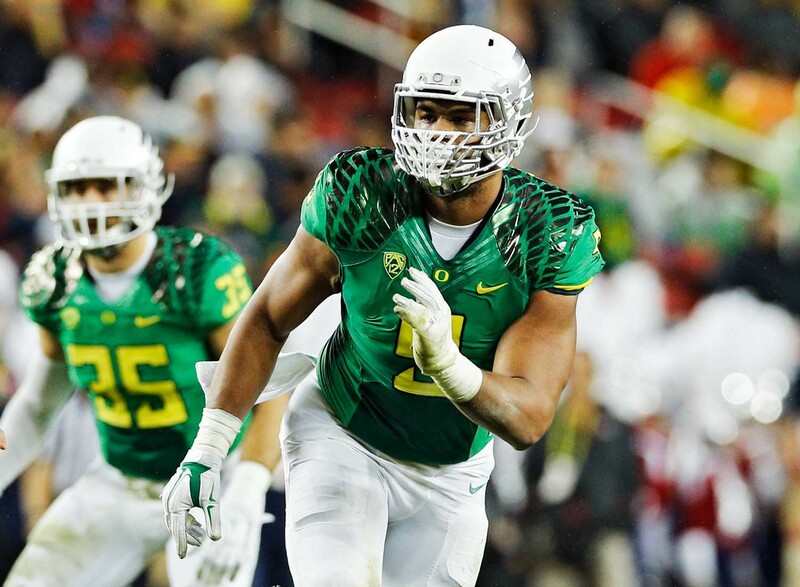 He reminds me of former Oregon prospect Dion Jordan, who was picked third overall by the Dolphins in 2013, though the hope would be that Armstead is able to produce more at the level of Ziggy Ansah (15.5 sacks), another relatively inexperienced and athletic pass rusher from that class. Given that Armstead's numbers don't really tell you much about what he might become, I'll be watching to make sure he's one of those guys who jumps up to be at the front of the line when it's time to do drills. Clemmings is a former defensive player who was on the offensive line for just two years at Pittsburgh. I'd want to talk to him about why he was moved from defense to offense. I also want to know if he's capable of playing left tackle in the NFL. Does he have the feet to block the speed rusher on the left side? The short shuttle and cone drill should give me a good idea of that. Can Coates, who will likely be among the fastest of anyone at the combine, catch and run routes? He had inconsistent hands at Auburn, though he's supposed to be improving in that area. Is he a hands catcher, or does he trap the ball against his body? How he does in the gauntlet drill -- the receiver runs down the field, catching balls thrown at him one at a time from either side - will be a good indicator. Coates is part of a receiver group that has a chance to be nearly as special as last year's. Green-Beckham -- who was dismissed by Missouri in April 2014 and didn't play at all last season as a transfer to Oklahoma -- is one of the big question marks of this class. How fast is he? Does he catch the ball in his hands or trap it? Can he make the football moves he'll need to make at the pro level? At this point, everybody will simply be trying to get a read on where he is as a player. Harold is a three-year player who started just two seasons at Virginia -- but he racked up 15.5 sacks in that span. Does he have the body type that will allow him to add about 15 pounds without sacrificing speed? His value lies in his ability to reach the quarterback as a 4-3 pass-rusher. Will Orchard be able to play every week like he did against Stanford and top tackle prospect Andrus Peat last season, when he had 10 tackles, 3.5 sacks and one forced fumble? Of course, we won't be able to answer that, but I will be looking to see if Orchard has the kind of get-off and speed to produce at the pro level. How quickly will he get across the bag during the bag drills? How quickly will he get across the line in the simulated pass-rush drills? I also want to see if he has the body build to support another 15 pounds without losing any quickness. Perriman caught just 50 passes last season -- but he averaged 20.9 yards per catch. That's the kind of number that'll light a fire in you. He appears to have outstanding speed and size, and he obviously has a knack for the big play. He also has a solid football pedigree: His father, Brett, was a second-round pick by the New Orleans Saints in 1988 who went on to play in the NFL for 10 seasons. If Perriman shows he can catch and run routes and demonstrates that there's improvement on the horizon, he could make a huge jump at the combine. UPDATE: Perriman will not be able to work out at the combine because of a hamstring issue; instead, he'll work out at his pro day on March 25. Petty is one of the players who can help himself the most in Indy. The NFL is desperate for quarterbacks, and this guy started two years for a pretty good Baylor team -- and yet, he's not even mentioned as a possibility in the first three rounds. Given that the Bears used the shotgun and a very small playbook, Petty will have to show he can take snaps under center and be accurate on three-, five- and seven-step drops. I think we'll see he's improved since the Senior Bowl and throw well. Iowa does a superb job coaching and developing offensive linemen. Scherff is probably a better athlete than the last two tackles to come out of Iowa -- Bryan Bulaga and Riley Reiff -- but he has to prove he can be a successful left tackle in the NFL if he has any shot of being a top-10 pick. He didn't play as well at Iowa last season as he did in 2013; in particular, I'm thinking of his performance in a 38-31 loss to Maryland last October, in which defensive end Andre Monroe gave him fits. We should get a handle on Scherff's potential at left tackle in the short shuttle and three-cone drill. At Washington, Thompson bounced from defensive back to linebacker and even to running back, finishing his time as a Husky with 233 tackles, five interceptions, 3.5 sacks and 456 rushing yards (7.5 per carry). He also scored six times last season (twice on offense and four times on defense). Now, of course, everyone wants to find out if Thompson, who will work out as a linebacker and a defensive back, has a position. Does he have the coverage skills to play safety? Does he have the kind of body that will allow him to put on the additional weight needed to play linebacker? The upshot is that he'll turn into a Lavonte David-type of defender. White is one of the guys that everyone in Indy will be interested in. Nobody was talking about him last spring -- and then he exploded, hauling in 109 catches for 1,447 yards and 10 scores, simply dominating opponents despite the fact that he was playing without a top-flight quarterback. The combine is huge for him, not least because it's a chance to confirm he's actually as fast as he looks. There's also his lack of experience, with just two seasons at West Virginia on his resume following two at Lackawanna College. Is he a prospect who will pay dividends quickly, or is he more of a developmental project? Is he a good route-runner? Does he have good instincts? Will he win the 50-50 battle? Guys that leave school after three years tend to come with questions, and there are plenty about Williams. Just how good a catcher is he really? How fast is he? It looked like Williams succeeded at Minnesota largely by running over defenders, who tended to be smaller than him. Does he have the strength, speed and quickness to respond when the bigger linebackers at the NFL level engage him or bump him coming off the line? Williams has a chance to go in the first round, provided he makes his mark in Indy.